Facebook released Mcrouter back on September 15th, they went through what it does and how it helps Facebook and other companies. Most of the documentation is on the Github wiki page, which has different types of setups, command line options and different supported features. It's a really great tool when you have a ton of clients connecting to your cache layer and need to route them appropriately. One item they left off the documentation was SSL. It was clear you needed SSL certificate, private key and the signing CA public key. But wasn't clear was the implementation details and how the authentication between two Mcrouter's actually happened. I will clear that up for you here. Just an FYI, I did end up adding this to the GIthub wiki for Mcrouter. I recently migrated my blog from a DigitalOcean server running Wordpress to Jekyll running on Github Pages, behind Cloudflare. I went from a paid server running a blogging software to a free service (github pages) with Jekyll as the static blog framework. During the move I noticed I would need to stop using SSL and that introduced the ability to use Cloudflare for free. I use a free pingdom account to monitor my blog and after moving it I checked the account and to my surprise I had a 633% decrease in response time, it went from 950 ms to 150 ms.
That speed decrease is very impressive! 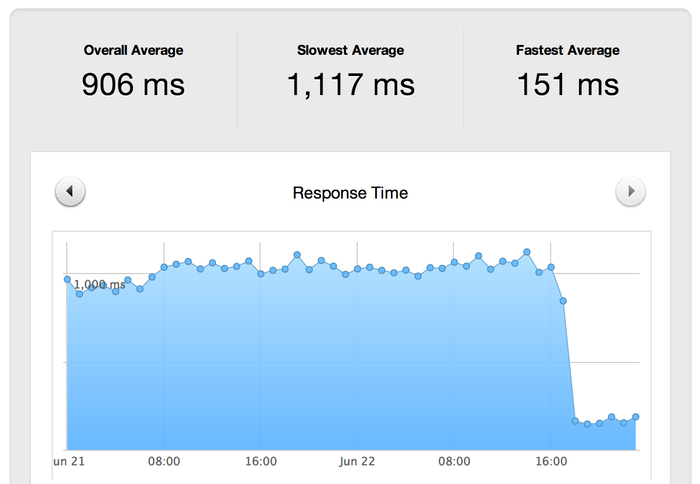 Using Github's infrastructure for speed and Cloudflare's services to provide protection and speed I greatly increased my availability and decreased response time. Thank you for such wonderfully free services! Those are much easier to understand and use since they appear to be in the request object itself, most likely coming from rack itself and Sinatra is just making it easier on us. There should be an easier way to gather the version requested in sinatra as that seems to be the most used standard. I needed to understand multipart uploads with fog and how to keep the ETag MD5sum the same with multipart or single stream uploads to S3. In the end it was very embarrassing for Amazon to not have the ETag working the same for both. I understand the fact that both had a different route on getting to S3, but in the end 1 file is created meaning 1 ETag algorithm should be used. The basics is to do the multipart upload, then overwrite the file with itself, S3 will then give you the proper md5sum under the ETag value. Below is the code to do the upload then copy the file to itself with a normalized ETag.